In 1995 the United Nations Environment Program launched ‘Leave It To Us’, the first children and youth environment conference in the world. Hundreds of young people from around the world met in Eastbourne, UK for 5 days of speeches, workshops and an opportunity to have a say about their environment. Four delegates from Western Australia were invited to represent their schools and communities. James and Sophia represented the Milyu Project at South Perth Primary School – a whole school initiative to care for the Milyu Nature Reserve on the Swan River Foreshore in South Perth. Alicia represented her school student environment club at Bullsbrook District High School run and managed by children. Sarah came from John Septimus Roe, keen to have a say about local bushland and other environmental issues. Together these four young people had an opportunity to hear from young people around the world, hear about groundbreaking environmental initiatives and commit to some form of action when they returned to Western Australia. The delegates at the ‘Leave it to Us’ presented their Leave It to Us Challenges 1995to the people of the World. 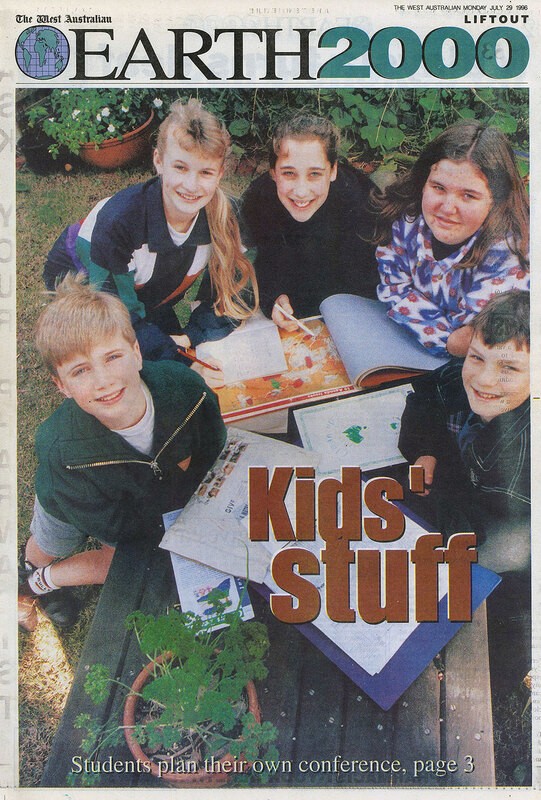 The Western Australian team returned to Perth and Kids Helping Kids was the result – an environmental conference run by kids for kids.